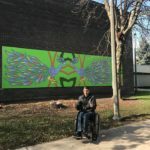 As part of the 38th ward’s Year of Public Art (YOPA) project funded by DCASE and Alderman Sposato, a 36′ long mural on panels was installed on the east wall of Merrimac Parks main building. Arts Alive Chicago worked for almost one year with the ward art committee, DCASE and the Chicago Park District to make this happen. The mural artist was T. Passero.